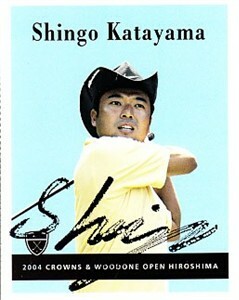 Rare Nike Golf trading card issued in late 2004 or early 2005 autographed in black marker by Japanese superstar golfer Shingo Katayama, a 5-time winner of the Japan Golf Tour money list. Signature is streaked due to glossy coating and bottom left corner has tiny chunk missing. Has typical perforations. Obtained in person at Southern California PGA Tour event, with certificate of authenticity from AutographsForSale.com. ONLY ONE IN THIS CONDITION AVAILABLE FOR SALE.